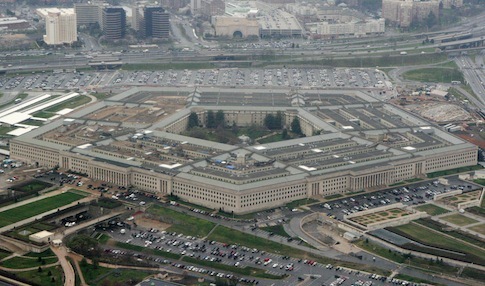 A U.S. Central Command official confirmed to the Washington Free Beacon on Monday that warning pamphlets were dropped on Islamic State targets 45 minutes before bombing sorties in order "to minimize the risks to civilians." The confirmation comes on the heels of disclosures that U.S. military pilots were blocked from dropping 75 percent of their ordinance on likely targets due to concerns about harming civilians. The warning leaflets were dropped in advance of strikes on an Islamic State (also known as ISIS or ISIL) convoy of trucks near the city of Al-Bukamal in Syria, according to the military official. "We can confirm that leaflets were used prior to air strike operations in the area near Al-Bukamal, as part of Operation Tidal Wave II," the source said. "The leaflets are used to minimize the risks to civilians." The leaflets read: "Get out of your trucks now and run away from them." Another message stated: "Warning: airstrikes are coming. Oil trucks will be destroyed. Get away from your oil trucks immediately. Do not risk your life," according to the Pentagon. Col. Steve Warren, a Pentagon spokesman, confirmed the warning messages in a recent briefing to reporters discussing the strikes. "In Al-Bukamal, we destroyed 116 tanker trucks, which we believe will reduce ISIL's ability to transport its stolen oil products," Warren explained. "This is our first strike against tanker trucks, and to minimize risks to civilians, we conducted a leaflet drop prior to the strike." "And so, these are the leaflets that we dropped—about 45 minutes before the airstrikes actually began," Warren said. "Again, we combine these leaflet drops with very low altitude passes of some of our attack aviation, which sends a very powerful message." Rep. Ed Royce (R., Calif.), chair of the House Foreign Affairs Committee, confirmed last week that he had been receiving reports from U.S. pilots who claimed they were blocked by the Obama administration from dropping 75 percent of their ordinance. "You went 12 full months while ISIS was on the march without the U.S. using that air power and now as the pilots come back to talk to us they say three-quarters of our ordnance we can’t drop, we can’t get clearance even when we have a clear target in front of us," Royce said at the time. "I don’t understand this strategy at all because this is what has allowed ISIS the advantage and ability to recruit." When asked to address Royce’s statement last week, a Pentagon official defended the Obama administration’s policy and said that the military is working to prevent civilian casualties. "The bottom line is that we will not stoop to the level of our enemy and put civilians more in harm’s way than absolutely necessary," the official told the Free Beacon, explaining that the military often conducts flights "and don’t strike anything." This entry was posted in National Security and tagged Islamic State, Military, Pentagon. Bookmark the permalink.